Below is an article about WNS being found in Fern Cave in Jackson County, Alabama. It is verbatim from the U.S. Fish and Wildlife Service website at http://www.fws.gov/refuges/news/White-noseSyndromeFernCaveRefuge.html. “The U.S. 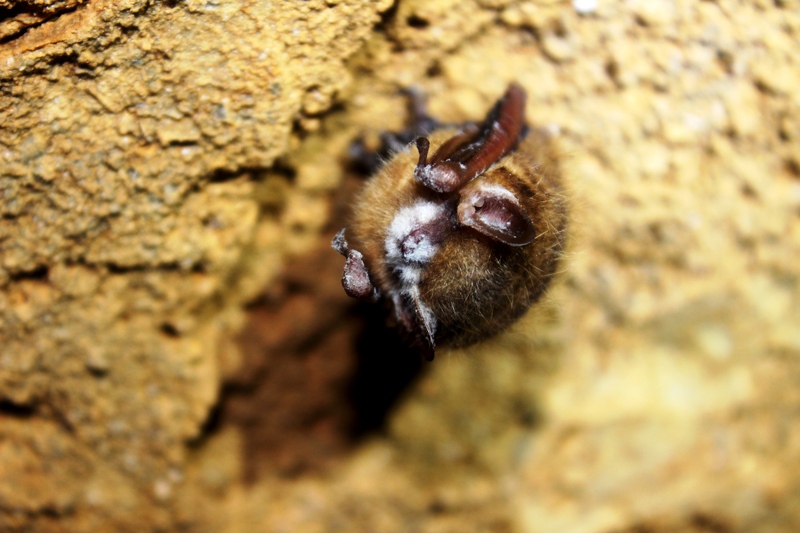 Fish and Wildlife Service has confirmed the presence of white-nose syndrome at Fern Cave National Wildlife Refuge in Jackson County, Alabama. Fern Cave provides winter hibernation habitat for several bat species, and contains the largest documented wintering colony of federally listed endangered gray bats, with over one million gray bats hibernating there. The disease was confirmed in tri-colored bats that were collected at two entrances to the cave. White-nose syndrome (WNS) has decimated bat populations across eastern North America, with mortality rates reaching up to 100 percent at some sites. First documented in New York in 2006/2007, the disease has spread into 22 states and five Canadian provinces. Bats with WNS may exhibit unusual behavior during cold winter months, including flying outside during the day and clustering near the entrances of caves and mines where they hibernate. Bats have been found sick and dying in unprecedented numbers near affected sites. White-nose syndrome has been documented in seven hibernating bat species, including two federally listed endangered species, the Indiana bat andgray bat. The infected tri-colored bats were discovered on winter surveillance trips, conducted by the U.S. Fish and Wildlife Service and members of theNational Speleological Society (NSS) and Southeastern Cave Conservancy, Inc. (SCCi). 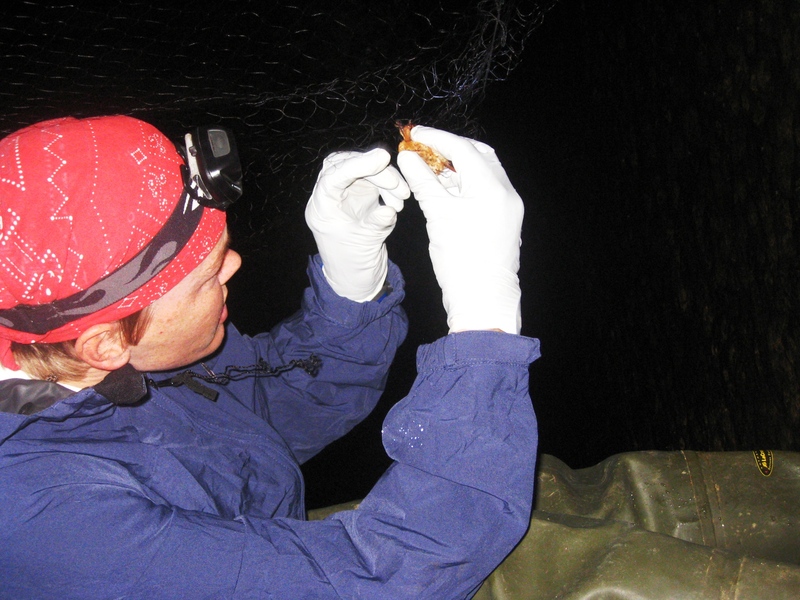 Biologists observed white fungus on the muzzles, wings and tail membranes of several tri-colored bats, leading them to collect specimens for analysis. The gray bat, federally listed as an endangered species in 1976, occupies a limited geographic range in limestone karst areas of the southeastern United States. With rare exceptions, gray bats live in caves year-round. Gray bats live in very large numbers in only a few caves, making them extremely vulnerable to disturbance. Cooperative conservation measures, such as restricting human access to gray bat roosting sites, have been successful in helping gray bat populations recover in many areas. The potential impact of WNS on gray bats is still unknown. Fern Cave Refuge consists of 199 acres of forested hillside above a massive cave with many stalactite and stalagmite-filled rooms. The cave has five hidden entrances, four on the refuge. One entrance is owned and managed by SCCi. Access is extremely difficult and has been described as “a vertical and horizontal maze” by expert cavers. Horizontal sections of the cave are known to be more than 15 miles long and vertical drops of 450 feet are found within. The partnership with NSS and SCCi has been critical to monitoring the gray bat population at Fern Cave. The Service is leading a cooperative effort with federal and state agencies, tribes, researchers, universities and other non-government organizations to understand and manage the spread of WNS. While bat-to-bat transmission is presumed to be the primary method of spreading the disease, scientists believe that humans can inadvertently transport fungal spores on clothing, footwear, and gear that has been in infected sites. Fern Cave is not open to the general public and the entrances on the refuge are closed to protect gray bats. Researchers and permitted cavers entering Fern Cave take great care to reduce the risk of transporting fungus into or out of the cave, and minimize disturbance of roosting bats. The photo below is one of the tricolored bats affected by WNS in Fern Cave.